This could be classified as a further example people respond to incentives or evidence of the theory of unintended consequences. It is also a classic "supply and demand" example of the effects of price ceilings beloved of microeconomics textbooks. 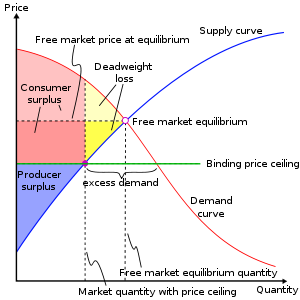 "The prices for producers are below the costs of production. Two years ago it cost me just over six dollars to produce a kilo of coffee. Today the state pay a fixed price of four and half dollars per kilo. I was losing money by producing coffee." "The price controls are a guarantee that the Venezuelan people have the right to food and the government compensates the producers by direct and indirect subsidies. That way, producers have a fair income and people have that sacred right of access to basic foods." The Finanical Times has a piece that describes another unintended consequence of these price controls. Price controls have made matters worse. Increasing amounts of coffee – and many other goods – are smuggled abroad to be sold at international prices. “Of course there’s contraband. What does Chávez expect when you can sell coffee in Colombia for double or triple the price?” said one coffee producer, who requested anonymity. Even with rising domestic demand it is expected that Venezuela's coffee production will be about 38,000 tonnes this year, down 70% from its peak. This compares to a 55,000 tonnes level of demand in the country. More data are available here. The shortfall has to be imported and the Venezuelan government cannot fix the price of imports but that doesn't mean they're not trying. "In trying to organize and protect domestic industries with the blunt instrument of state policy, Chavez has once again fallen prey to the law of unintended consequences. The market is there, globally – but it’s been badly distorted. In trying to fix domestic coffee production, the Venezuelan leader has exacerbated the very problem he set out to cure."